Devastating tsunamis could be halted before hitting the Earth's shoreline by firing deep-ocean sound waves at the oncoming mass of water, new research has proposed. Dr Usama Kadri, from Cardiff University's School of Mathematics, believes that lives could ultimately be saved by using acoustic-gravity waves (AGWs) against tsunamis that are triggered by earthquakes, landslides and other violent geological events. In a paper published today in the journal Heliyon, Dr Kadri proposes that if we can find a way to engineer these waves, they can be fired at an incoming tsunami and will react with the wave in such a way that reduces its amplitude, or height, and causes its energy to be dissipated over a large area. "Within the last two decades, tsunamis have been responsible for the loss of almost half a million lives, widespread long-lasting destruction, profound environmental effects and global financial crisis," Dr Kadri said. "Up until now, little attention has been paid to trying to mitigate tsunamis and the potential of acoustic-gravity waves remains largely unexplored." 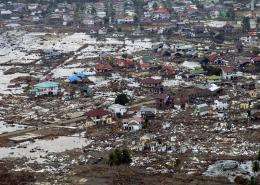 The devastating tsunami that was generated in the Indian Ocean in 2004 after a magnitude 9 earthquake has been recorded as one of the deadliest natural disasters in recent history after it caused over 230,000 deaths in 14 countries. The energy released on the Earth's surface by the earthquake and subsequent tsunami was estimated to be the equivalent of over 1,500 times that of the Hiroshima atomic bomb. In order to use AGWs in tsunami mitigation, engineers will firstly need to devise highly accurate AGW frequency transmitters or modulators, which Dr Kadri concedes would be challenging. It may also be possible to utilise the AGWs that are naturally generated in the ocean when a violent geological event, such as an earthquake, occurs – essentially using nature's natural processes against itself. Indeed, Dr Kadri has already shown that naturally occurring AGWs could be utilised in an early tsunami detection system by placing detection systems in the deep ocean. Dr Kadri continued: "In practice, generating the appropriate acoustic-gravity waves introduces serious challenges due to the high energy required for an effective interaction with a tsunami. However, this study has provided proof-of-concept that devastating tsunamis could be mitigated by using acoustic-gravity waves to redistribute the huge amounts of energy stored within the wave, potentially saving lives and billions of pounds worth of damage." 1500 times the Hiroshima nuke (5 Ktonne) = about 7.5 Megaton. So we need, say, to deter a tidal wave hitting, say, Aceh Province in Indonesia, to detonate an H-bomb of that size just offshore from Acey Province. Methinks this 'cure' is MUCH worse than the 'disease' that it purports to be able to 'mitigate'. Hope the victims of the 2004 slaughter of over 300,000 Acheans and untold others will haunt whoever tries to carry out such a monstrous crime, however 'well meaning'. WG, I think it could be used to help ocean life forms, moving fresh water into low oxygen areas, pushing plankton around to encourage fish growth. Of course, all the cetaceans would go deaf and then become disoriented and beach themselves. This would ruin the ocean views of all the pretentious idiots who believe success at play-acting means their feelz are so important that it's OK to sacrifice a few million poor brown and black people living near the oceans in third world toilets so that their Malibu/Santa Barbara/Carmel real estate values may be preserved. They would find much sympathy from the 1% who have 5th vacation homes in Kennebunkport, who would order their political lackeys to pass laws abolishing the tsunami killing processes. The AGW wavelength is measured in kilometers and is thus far too low of a frequency to be heard.